Made of high quality aircraft aluminum, this is the most adjustable lift stand available, adjusting to (11) height positions: from 9-1/2 inch to 14-1/2 inch tall, designed for dirt bikes from 50cc to 650cc. 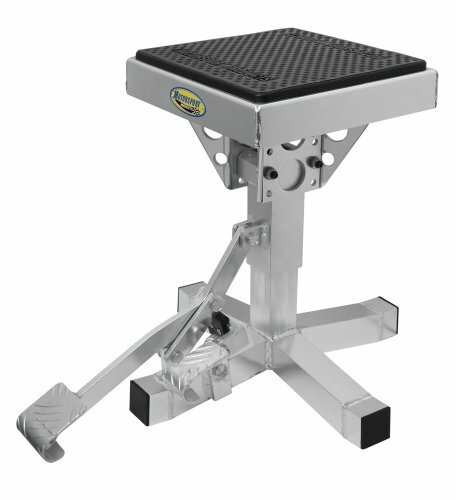 Large heavy-duty top easily lifts both wheels off the ground by stepping on foot lever, even youth riders can put their own bike on this stand. Foot activated release trigger with nylon slider block. Features extra thick, oil and gas resistant top rubber pad and large rivets recessed so they won't break off. Super strong lower legs constructed from box aluminum tubing are arched with flat ends and a 16 inch wide stance for maximum stability even on uneven ground.